Colour Blocking is an effective and simple technique that can be used on any layout. And it’s even better when combined with stickers. I have used summer scrapbooking stickers on this layout to show you how to combine the two techniques. The mosaic of colour created on this page combined with a fresh geometric design creates a captivating layout when embellished with summer stickers. This layout was created using five shades of Bazzill cardstock (pink, purple, aqua, green and yellow) and Doodlebug Summer Treats stickers. 1. Use the pink Bazzil cardstock as your background. 2. Mat two horizontal photos with yellow Bazzill cardstock, making sure the resulting mats measure 14.5cm by 9.5cm. 3. 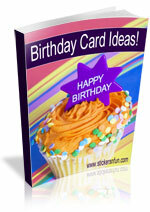 Now it is time to cut out 24 squares from your Bazzill cardstock. Each square should measure 4.5cm by 4.5cm. You will need 8 aqua squares, 8 purple squares, 6 green squares and 2 yellow squares. 4. Arrange your squares and photo mats on your background, as shown in the layout above. I suggest starting in the top left corner and working your way across and down from there. The spacing between each element should be approximately 0.5cm. 5. 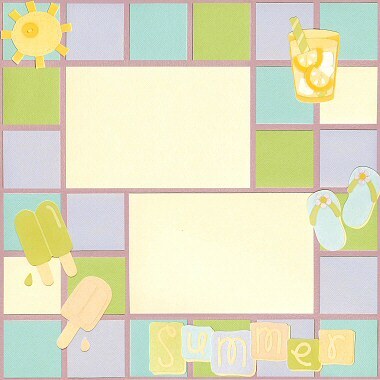 Place your ‘Summer’ sticker from Doodlebug Summer Treats stickers in the bottom right corner of your page, as shown above, to give your scrapbooking layout a title. 6. Finally, arrange your Summer Treats stickers around your page so that they overlap different squares and your photo mats. Use the layout above as a guide to how to place them around your page. What do you think? Do you like this scrapbooking idea using summer scrapbooking stickers? Do you have any questions? Would you have done anything different? We’d love to hear from you! Please leave a comment below. This entry was posted on Saturday, May 9th, 2009 at 8:41 pm	and is filed under Beach, Colour Blocking, Scrapbooking Stickers. You can follow any responses to this entry through the RSS 2.0 feed. You can leave a response, or trackback from your own site. your blog posts. After all I will be subscribing to your rss feed and I am hoping you write again soon! aconsejo al mundo entero. de C.V. (“Conjunto HB/PS”), Applica Manufacturing, S.
un delicioso batido hecho por la increíble batidora Twist&Take Sport. y cuatro (dieciocho dólares americanos y 64 centavos de los Moulinex ZU5008 es algo cara mas prepara un zumo exquisito, suave y sin restos de pulpa semillas. Touche. Solid arguments. Keep up thhe good effort. you. Look forwatd too looking into yolur wweb pagfe foor a second time. yoou discuzs and would love tto have yyou sare sime stories/information. I knoww mmy visitors wouyld apprecciate yoour work. If you’re even remotely interested, feel feee tto end mee an e-mail.